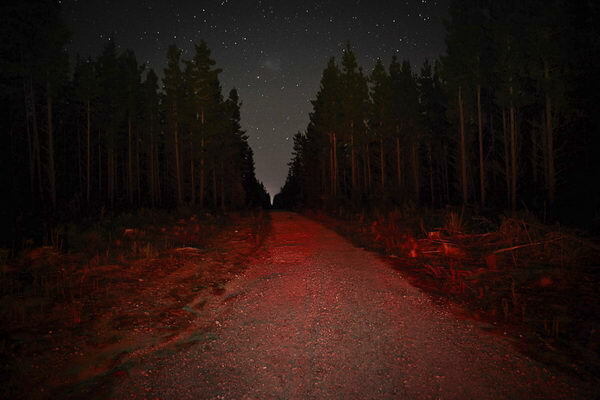 "This photograph was part of a series taken over a number of visits to the Belanglo State Forest, the scene of the now infamous Backpacker Murders. In the light of day it is almost possible to forget the history of this place. It feels ordinary, quiet â€“ even beautiful in places. This is a place is tainted by history though. Thoughts of what happened here are never far away. It is this history of the place that has drawn me here. The idea of a place so maligned in the public consciousness. How does the reality compare to the perception? As night falls, the forest closes in, the senses strain and reality begins to feel remote."